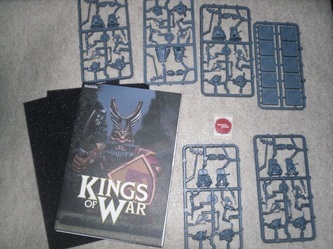 This time out I take a look at the half-pint, ale drinking mountain dwellers from the Mantic Games line Kings of War. Today I'll introduce you to the Dwarf IronWatch Troop boxed set from Mantic Games. Like all of the Mantic Games releases, this set also comes in a VHS-like clam-shell plastic box. Inside you will find two thin sheets of foam, five models sprues, a single sprue with 10x 20mm square bases, a Mantic Point sticker and a fold out poster with dwarf stuff on it. A Troop boxed set is also 10x models. The models come on sprues with 2x models per sprue, and like the Undead models I reviewed a while back, these too are by design made so that assembly requires minimal effort. 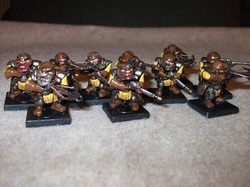 They accomplish this with the dwarf models by having a lower torso with the back half of the upper torso pre-made, and the upper torso front snaps into place. 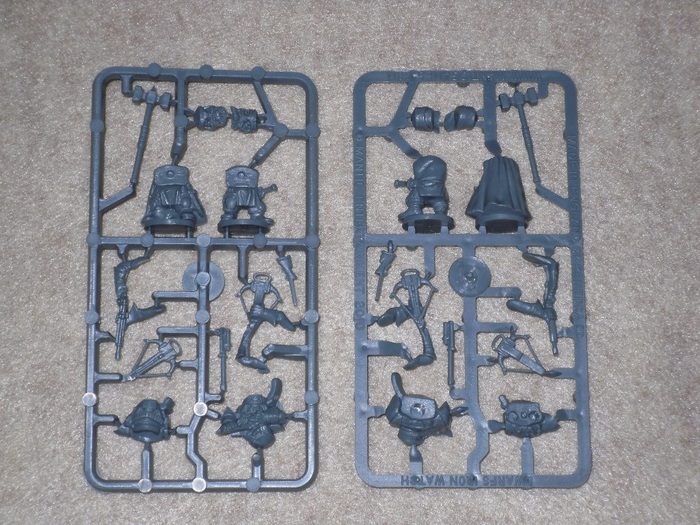 In this assortment each sprue has 2x lower torsos, and 1x upper torso with head already sculpted on, and 1x upper torso with the choice of 2x different heads. The set of arms provided come attached to either a rifle, or a crossbow, so you can choose to use either. One of the upper torsos is also molded in such a way that arms are already molded on, so that you can add the rifle barrel, or the bow part of the crossbow to them. 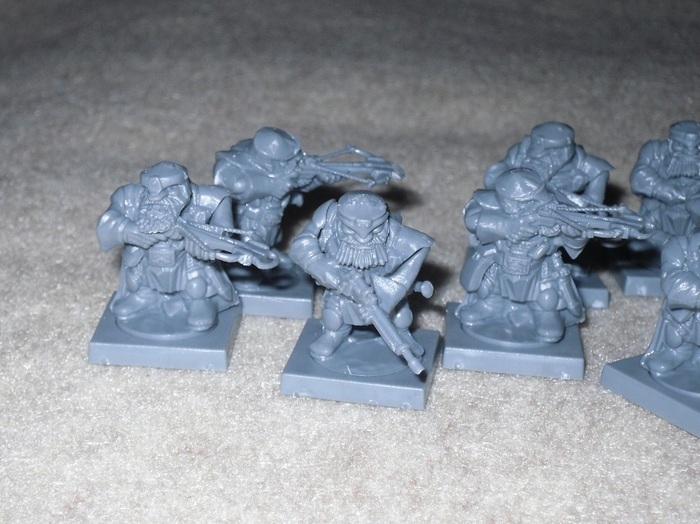 Also like all of the Mantic Games plastic models I've seen so far, these too are molded so that the feet come attached to a small round integral base, which plugs into the round hole socket cut into the 20mm square bases provided. Again, the idea behind this is to make assembly as quick and painless as possible, and it works well. My only complaint with these models is that they're short to begin with being dwarfs, so their asses are so low to the ground, that trying to add some basing details between their feet and under the models can be a little tricky. There's just not much room to work with underneath, especially underneath the ones with capes. Sculpt-wise they're quite detailed. I'd say they're easily as detailed as anything from the competition. The facial details are quite crisp and pronounced, and the armor bits can be picked out and identified quite well. It's a different look tho in comparison to other dwarf models I've seen. They're quite simple and fun to paint as well, which is another plus. Mantic Games has managed to come up with their own Dwarf look and style, which is quite an accomplishment. 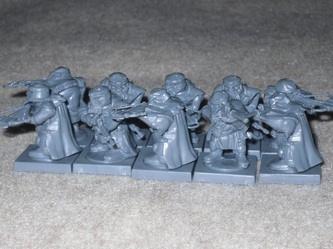 They don't look much like GW's WFB dwarfs at all, while not looking much like the LotR GW dwarfs either. They look quite unique. 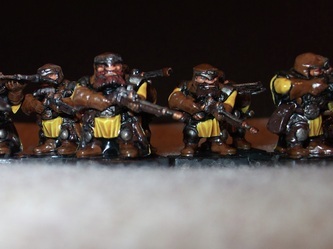 The Mantic Games style of Dwarf portrays somewhat stockier dwarfs than what I've seen elsewhere, and they look more squared-off to me too. They definitely have more of an animated, or comic-book-like look about them. 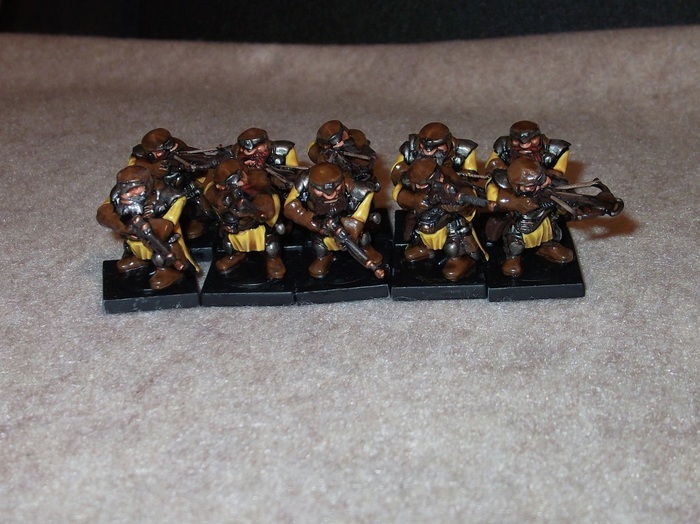 Side by side, I can't say these would be ideal to integrate in with an existing WFB dwarf army. They have a completely unique and different look of their own, that really make them more suited for being with other models of their own kind. 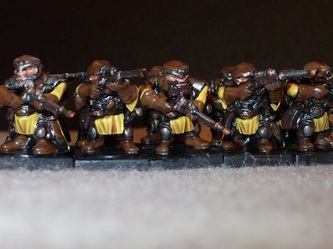 However, that's not to say they wouldn't be good dwarf models for WFB. 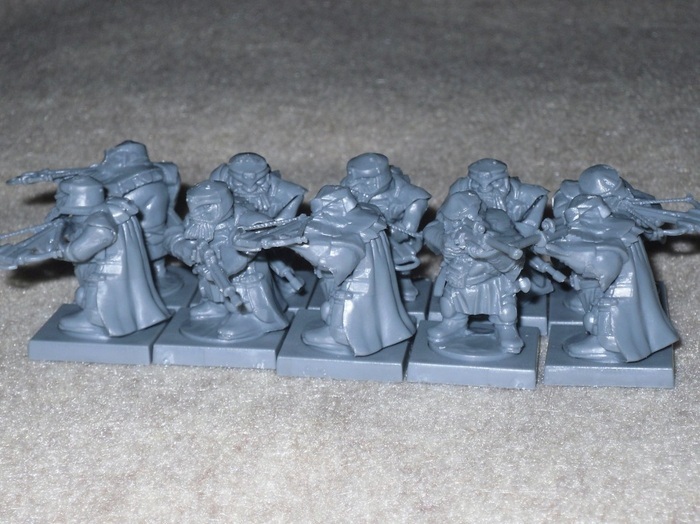 In a Mantic exclusive army, they would certainly be a heck of a lot cheaper than using GW exclusive models for 8th Edition Warhammer Fantasy Battles. 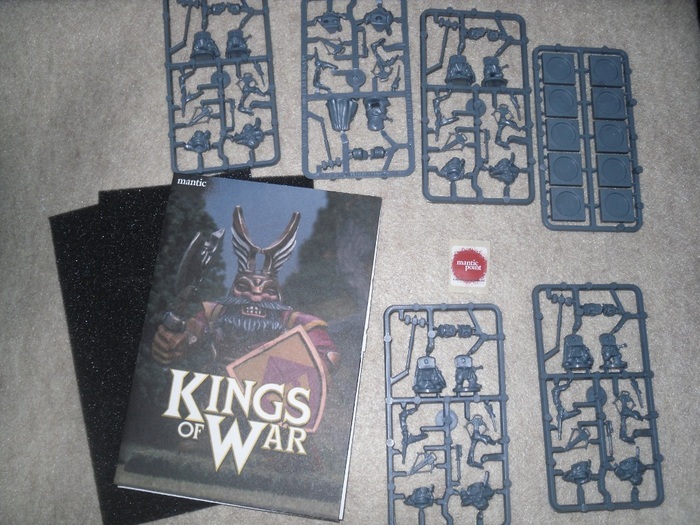 As I write this Mantic Games has begun the closed Beta test of their own Kings of War ruleset, written by former GW rule creator Alessio Cavatore. So not only are these nice models for stand-in Warhammer Fantasy Battles 8th Edition, but they'll be ideal for Kings of War and other games even like Song of Blades and Heroes from Ganesha Games just the same. Cost is really where these models make so much sense too. Mantic Games plastic models are priced all pretty much the same. The 10x model Troop boxes like this one are never usually more than $12, making them roughly $1.20 per model, depending on where you purchase them. 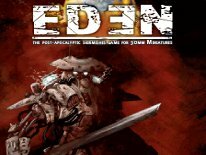 The only thing you don't get with the Mantic Games models is loads of options. It's a trade off, because the cost of the simplicity in assembly by design, is the lack of more options during assembly. They're definitely easy to clean up and assemble. 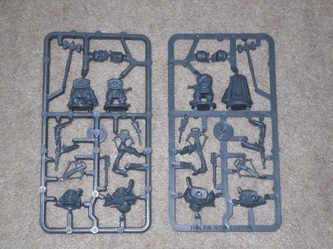 Granted there's a few mold lines to tend to, but nothing more than what you'll find on a sprue of plastic models from GW. The fit of the parts is also pretty much right on the money with this IronWatch Troop set. Just don't expect to do any elaborate scenic basing, because there's not a lot of room under the models, due to their height. At about $1 per model, I really can't knock this set. There's really nothing to complain about. 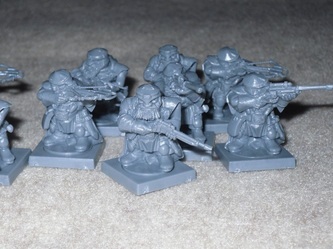 They assemble and are ready for primer in a matter of minutes, and they look like some dwarfs who are ready to shoot their way through the enemy lines. If you're looking for dwarf models with more customizing options, you'll need to pay 2x as much for the GW alternatives. 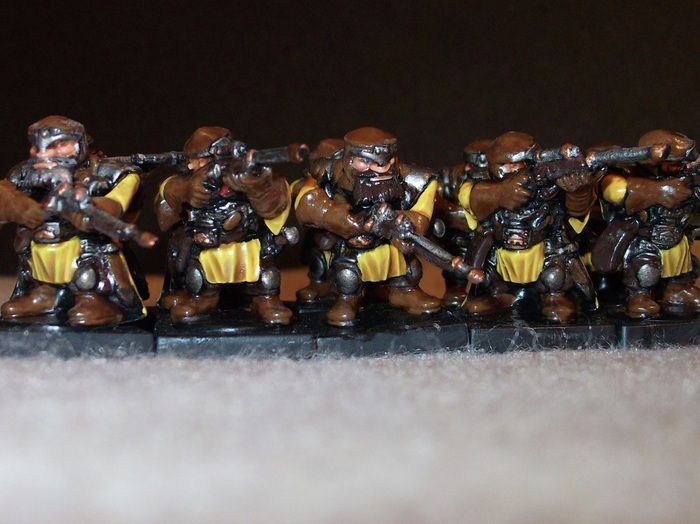 Either way you look at it, the budget minded gaming enthusiast won't find a better set of dwarfs armed for ranged combat in 28mm scale anywhere else.